An all-American classic juicy burger cooked on the griddle top with the perfect sear. 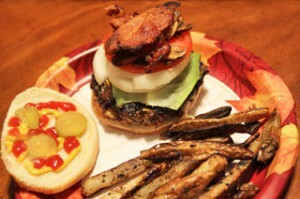 The burger is accompanied by delicious steak cut french fries also cooked on the griddle top. Form into patties and place on wax paper on a tray. Cook on preheated griddle to desired temperature.